Welcome to a brand new challenge for this month .This is quite an exciting month at Lulupu, as this month the Lulupu store completes 2 fabulous years :) Yep, you heard it right, its Lulupu's 2nd birthday month and we have a special challenge! This month we want you to use the alphabets of your favourite store's name - L U L U P U and come up with projects using anything that begins with at least 3 of these letters. Ok to make it simple L is for Layers, Leaves, Love and P is for Papers, Pencil colours,Punches etc and T is for Texture, Teal Colour etc. U is for Ultra Thick Embossing Enamel (UTEE), Umbrella etc. Now does that make it a bit simpler? And of course we want you to be super clever and innovative now. So basically it could be anything as long as you can justify the word and how its implemented in your project. 2. You must clearly mention the letters you have used in your project. 3. Everything Else - Altered Art, Recycle, Mixed Media and just about anything more! 4. If you are picked as a winner in one Category you cannot be picked a winner in another category. 5. You have until 31st March 2014 to participate. Please do click here to see the complete guidelines to ensure you do not miss on the chance to win even when we love your work! The prizes for each category will be revealed in our next post! Yes we are going to tease you just a bit more!! Not only will we be sharing some AMAZING projects, but there will be loads of prizes too to be won every now and then so be a regular here at the blog, like our Facebook Page and register for our Newsletter for discount vouchers all through March. To start with we have a Raffle going on HERE so do check it out and link your name. Here's a look at what I have created for this challenge. It's a hand-made photo frame and so suitable for our Category 2. I have made an altered photo-frame and I have worked on it from the scratch. This was a very plain white and red photo-frame. I first added two layers of Gesso on the base and then, applied two coats of Camlin teal color on it. This helped cover the base design completely and once it was dry, I took the Prima Designer stencil and the Sakura Modelling Texture paste and mixed some drops of the Distress Stain -Spiced Marmalade to it and applied it all over the sides of my frame to create the damask design on my frame. The corners and the golden leaves on the frame are all made with die-cuts covered with UTEE and heat-embossing it. P- Pearls, Pollens, Paints, Punches, Prima stencil. T -Texture Paste, Teal color. C - Cardstock to make the flowers, Corners, Cheery Lynn dies. I hope you all can join us in this month-long celebration in the fun challenges here. As, we have already told, there are loads of prizes to be won and of course loads of inspiration coming up from my other talented team member's as well so do play along our month-long challenge! Labels: 2nd anniversary, Hussena, Photo-Frame, stencils, texture paste. here's a question: can we use different colour combinations of a colour like lemon yellow and chrome yellow and thus will it be considered 2 alphabets or a single alphabet??? Thanks for dropping by our blog :) .And regarding your query I don't think you can use the starting letter of the same color twice ..Please don't submit projects with say light yellow or chrome yellow or Light pink or dark pink etc on the same work as they will be considered one color and one alphabet only.Hope this clears your doubt. Congratulations! !1 Exciting challenge & your frame is super Hussena. Super project Hussena! LOVE it! Wow ! Those colors are fab ,I loved the damask design on frame and the lovely flowers compliment it soo well ! 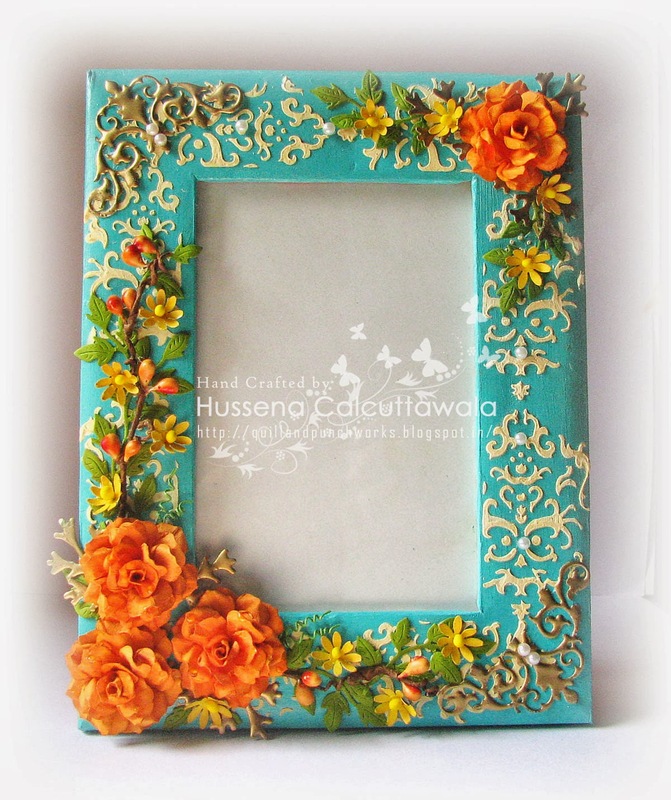 Delightful frame,Hussena ! Its a great kickoff for our gala event at Lulupu this month! WOW!! Beautiful frame Hussena. :) Love those flowers. And what a fantastic challenge !! Congrats Lulupu on completing 2 years!! The challenge is quite interesting. Hussena, your frame is absolutely gorgeous! I so love the unique color combo. Beautiful roses and the leafy vine looks so intricate. 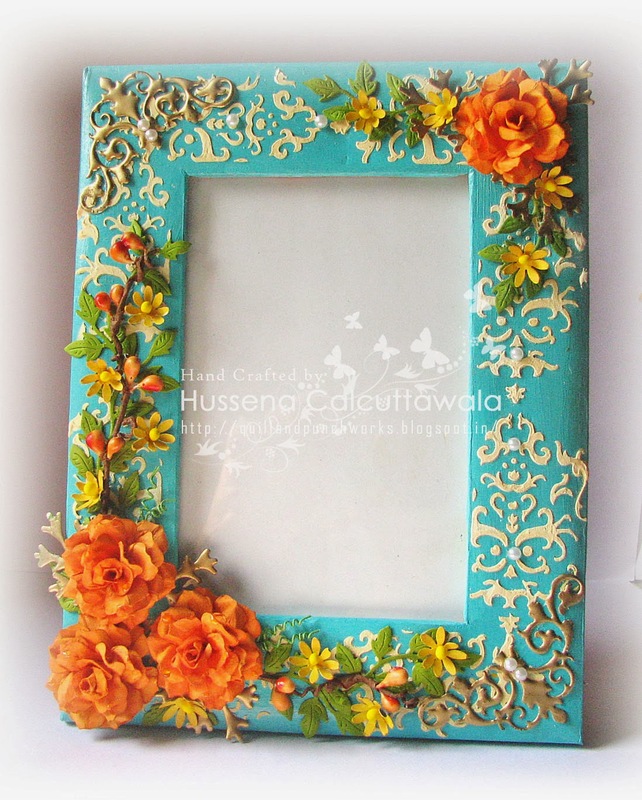 And hussena the frame is lovely and the color combos are Wow!! That's a vert creative take for a challenge and a super gorgeous frame. Fabulous frame Hussena..your color scheme as always superb !! I m scrolling up no. of times to see your frame again n again. Congrats to entire team of lulupu...grow bigger n bigger !! Made 2 entries in ur ONLY CARDS category...thanks once again for the chance to win so many yummy goodies....anddd wish u all d very best for ur coming years. I have posted my mixed media LO by mistake in the cards category and it refuses to get Deleted! I have linked it in the 2nd category also. Sorry for the inconvenience. Congrats Lulupu team for making it TWO.. I entered my scrapbook to Category 2. Thanks for the chance to win some surprise goodies. One more entry to category 3 with my paper mache..
Fun to create the card and great to be a part of this birthday celebration.. :). congratulations for completing 2yrs and wishing many more. submitted my entry. thanks for the challenge. Entered in category 3 and its my 3rd entry. Forgot to add 2 and 3 next to my name in respective entries. A Layered Heart-felt Card and a Flower Tutorial! Special Birthday & Shaped Card! Winners for #26 - Try Something New! 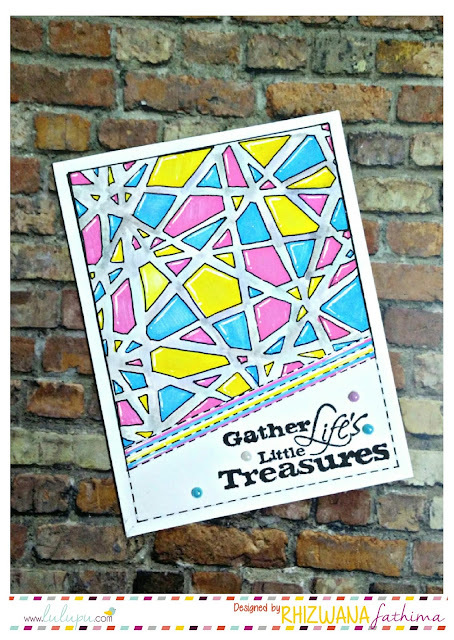 Mixed Media Clock and Prizes & Coupon voucher!